In the first group of questions below the block quotes, I've illustrated situations where a large number of cubesats are deployed at one launch (56 an 104 satellites) and it seemed to take quite a while for it to be figured out which one was which. What are proposed and recommended thing that can be done during deployment that would make it easier to get quick and reliable identifications in these situations? T.S. Kelso's comment about attitude information seems important, but I am not sure what the point is there exactly. CSpOC seems to have some recommendations, but I am not sure how they would be implemented by the various launch vehicles and agencies (SpaceX, ISRO, Rocket Labs) that are or will soon be doing many-cubesat deploys. "I checked with one of the operators — trying to get a head start on how we're going to ID all of these —and learned that the two SHERPA platforms are going to be released from the Falcon 9 with no attitude control or attitude determination." Kelso's bottom line: "I think this is not only irresponsible from a safety-of-flight perspective, but it jeopardizes the time and resources of many of the small operators who may never even hear from their satellites," he told Inside Outer Space. Kelso's guess is that about one-third of the satellites to be deployed will basically be space debris on release and there will be difficulties in sorting out this kind of mess. Kelso spoke extensively with the U.S. Air Force's 18th Space Control Squadron team last week, at the Space Situational Awareness Operators' Workshop in Denver. The 18th Space Control Squadron, which is based at Vandenberg, detects, tracks, and identifies all artificial objects in Earth orbit. "They have next to nothing useful from Spaceflight for the SSO-A launch on Monday. This is totally irresponsible. Be prepared for chaos," Kelso tweeted on Friday (Nov. 16). I reached out to Spaceflight for comment for my previous article about this launch, "Cluttering Space: Upcoming Launch Red Flagged." In response to that query, Spaceflight spokeswoman Christine Melby said via email: "Thank you for reaching out. At this time we do not have a comment on this article." But some other experts remained concerned. 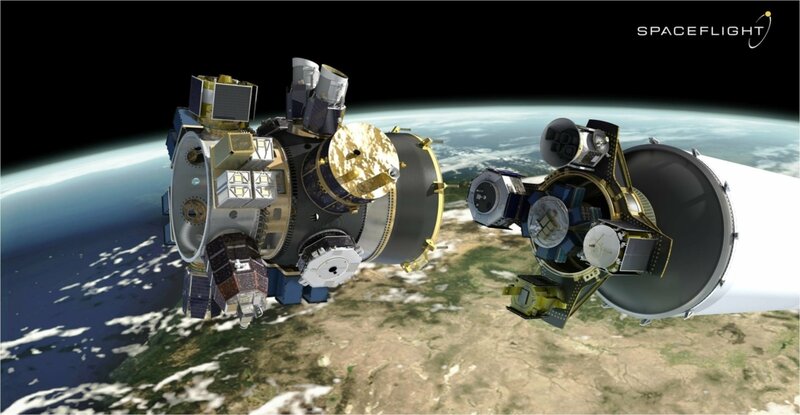 "CSpOC [the Combined Space Operations Center] has developed a set of recommendations for optimal cubesat operations, including launch deployment and identifications," said Jer-Chyi Liou, NASA's chief scientist for orbital debris in the Orbital Debris Program Office at the agency's Johnson Space Center in Houston. "It appears that the recommendations were not taken seriously by the SSO-A developers," Liou told Inside Outer Space. Those recommendations were based on the proliferation of cubesats and associated technology that pose unique tracking and identification challenges. You can read the recommendations here. It's been over two weeks now, will the real Humanity Star please stand up? ISRO's PSLV-C37 with 104 satellites - after 56 hours only six TLEs, which factor is greatest challenge? How are military satellites with (apparently) classified TLEs still showing up on sat map websites? Are SpaceBEEs actually hard to track? Browse other questions tagged cubesat payload-deployment or ask your own question. Are cubesats deployed with fully discharged batteries? Even those on Sherpa? With current or near-future Cubesat propulsion technology, largest aphelion achievable? What is the sequence of the main spacecraft and CubeSats separation during Falcon 9 launch? How are remove before flight (RBF) pins made? How well could the tether tension method of attitude control actually ultimately work for a cubesat system? Are 1U cubesats sufficiently detectable to get at least minimally usefully predictive public TLEs, updated regularly? Have there been individual satellites that have been deployed and recovered more than twice? Are the cubesats deployed from the ISS always directed “nadir and retrograde”?